The Jungle Book returns triumphantly to the big screen in an action-packed, beautifully filmed masterpiece that translates into cinematic gold! When DIsney’s trailer for the ‘live-action’ adaptation of the childhood book we all know and love dropped early last year, to say I was excited would be an understatement. But like so many others at the time, I believed that the voice casting for the film seemed a little off. But the promise of Bagheera and Baloo returning to the screen was too much to bear(pun intended). There was something that felt very raw about the way this film was made – like it came from the heart. It’ll tug at your heartstring, and have you hanging off the edge of your seat all in the same shot. 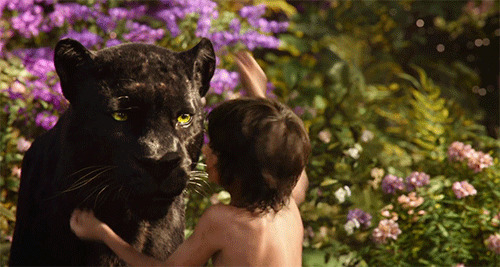 The main worry for many was the idea that Scarlett Johansson was voicing the python who tries to hypnotize Mowgli with her eyes before crushing him to death, Johansson’s depiction turns Kaa into an almost seductive and spiritual presence. This sequence felt slightly disconnected from the rest of the film, but because of the beautiful backdrop and the dramatic entrance of Baloo, It makes for one of the film’s most memorable moments. This rendition felt a little truer to the book than it did to the original 1967 animated film. And that just fine. It may be slightly less kid-friendly in that regard but it would have been a travesty to ruin the animation with cheap thrills and tricks. That’s not to say there’s no singing. Because there is, in fact, two songs made the cut. Which in theory sounds like a shame, but in this context felt like just the right amount. Especially when you find out one of the chosen songs is ‘The Bare Necessities’. That being said, for anyone under the age of 7, this Jungle Book is just dark enough to invoke nightmares. And while we all expected the majestic Shere Khan to be scary – which he is and then some – it was a surprise when Walken’s version of Louie, the “gigantopithecus” who wants to possess the power of the human’s red flower(fire) turned out to be more terrifying than even Khan. Even with the giant orangutan singing “I wanna Be Like You”, it felt like he could have squished Mowgli with one fell swoop of his hand. 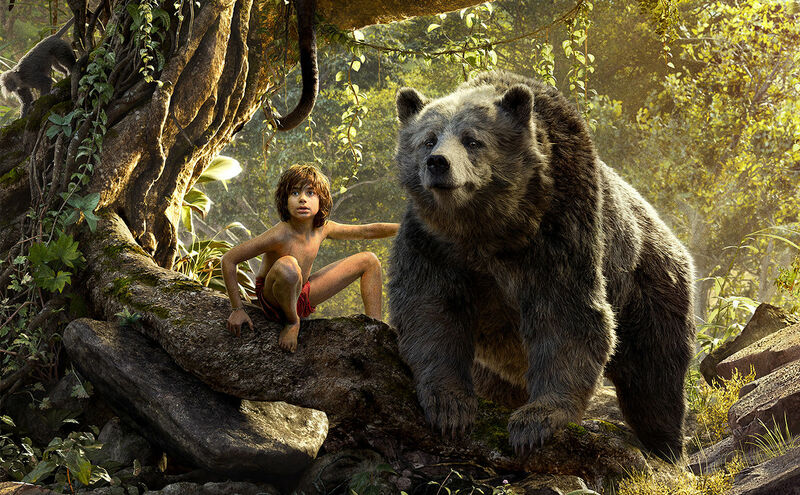 The new film didn’t completely abandon the plot of the classic jungle book film, far from it. The story stays pretty true to home, the only salient difference being that the python who tries to kill Mowgli is now a female and the idea that he was left as a toddler, not as a baby. And also, that Baloo seemed to be a little more of a ‘grifter’ type than previously depicted. Side note: Bill Murray was a fantastic choice for this cool-cat version of Baloo. The extent of the work in this film really sets in when you realise that the only non-CGI character is the amazingly talented Neel Sethi, who plays Mowgli. The animals are so mesmerisingly realistic, it’ll have you questioning what’s real and whats animated before your very eyes. Panthers can’t really talk… can they? I can’t stress the magnitude of the realism in this movie, the details put into every tree, waterfall, flower, leaf and creature within this setting is insane. It’s almost impossible to believe that the film wasn’t shot on location, but rather in Los Angeles, California. I honestly can’t stress how impressive the CGI is, in fact, the opening shot had me believing the movie filmed in a forest. Even the classic Disney castle opening had been specially created for this feature film, blending seamlessly into the opening scene. Of all the things that really struck me from this movie, including the immensely emotional and loving relationship that is evident between Mowgli and Raksha(his wolf mother), and the version of Bagheera that makes him indispensable and lovable. Of all the magnificent animation, spectacular acting and raw emotion of the piece. Perhaps one of the most striking things from the film was the elephants. Before you get your hopes up, no. They do not sing. Quite different from the comic military marching elephants we know from the animated film. They emerge like hidden gods who appear from the mists and then disappear back into the trees. Even Bagheera treats them with a deep seeded respect, and it’s easy to see why – instructing Mogali to bow along with him in their presence. The added mythology surrounding elephants make the few scenes they do appear in all the more dignified. The jungle is filled with hundreds of animals, most of which we meet when they gather at the Peace Rock to drink the water that remains as part of the Water Truce, a timeout called during a drought that enables all animals to gather at a water hole without fear of being eaten. Many of these other animal characters (excluding the wolves) are present to provide comic relief in a variety of scenes. Including a particularly funny cameo by the late Garry Shandling who plays a lovable, but possessive, porcupine called Ikki. Bear Necessities fans… get ready for chills. Did you see the movie? Let me know what you thought bellow? I saw it yesterday! T’was amazing. The amount of CGI is insane – it looks so real! I thought so too! Much more intense than I remembered as a kid. I remember having this on VHS as a kid. I’m so excited that i can take my kid to see it on the big screen in a way that wont seem old fashioned to him! I had it on tape too! Makes me feel so old! But this version was defiantly a triumph at bringing it into the 21st century.